Ah, Blair Waldorf, Season 1. She's always been my favorite because she has all the best lines and the best clothes. My friends were telling me this weekend about watching the first season of Gossip Girl and I went digging around for the best of Blair quotes (which I used for my post title). I didn't realize I'd channeled the queen bee herself a bit in my outfit until after I took the pictures. such a cute fall look! very blair. This is going straight into my fall inspiration folder, for real. I love all of the colors and layers in this outfit, though I've never seen an episode of gossip girl. Whoops! i have no idea what you're talking about cuz i don't watch gossip girl... but that aside, you look darling! i loveee this look for the fall! i agree with nicole; going right into inspiration file!! I have a problem. I know it. i love this outfit girl! 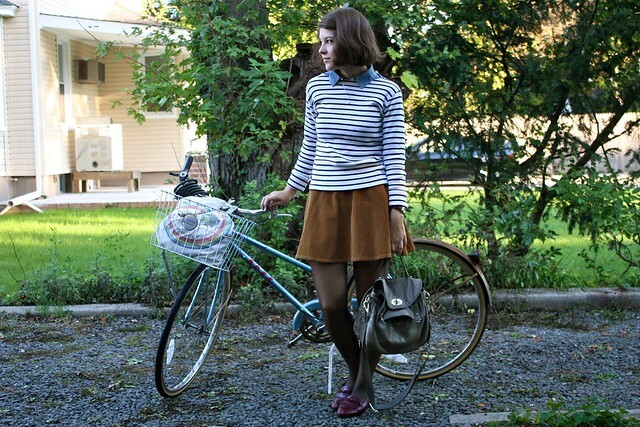 especially loving the loafers and bike! I love the sweater! Must go check out the petit bateau near my house! love your purse and shoes!! The gilr with the bike! Yumm! So cute! Blair's my favourite too! Not cos of her personality or the endless Chuck/Blair saga but exactly because of the things you mentioned - her outfits and her lines. Although I guess they're both part of her personality?? She is SO hilarious! "Schützt unsere Umwelt"...i used to have a bag like this, too. i love those cute wine colored loafers and the amazing bag! and yes. blair walford has the BEST style! I think my mom brought it home from Germany, I should probably look up what it means! I am loving loafers right now, so cute with everything! I love this. I really freaking love this! I want this outfit. And you're really darling. The end. 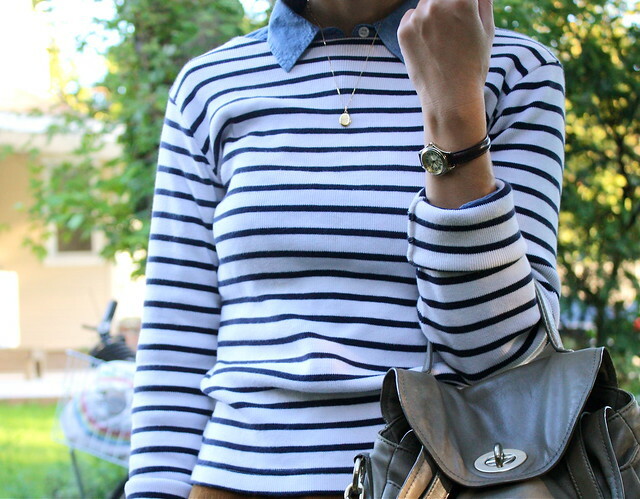 This sweater is exactly the nautical striped sweater that I'm looking for. Oh my! It's absolutely perfect. And that purse! Blair Waldorf is actually the one person who got me interested in fashion in the first place. Before BW, I wore jeans and my school tee everyday but then I saw Blair's outfits (even while bad-mouthing Gossip Girl)...and my life changed forever (maybe that's an exaggeration...) She's my very first style icon! YOU AMAZE ME! it sounds so silly caus its just an outfit but this look has totally got me out of my slump. I love it! So effortlessness and well balanced. Bravo! I love the way you wear sweaters. You always look so adorable in them. It makes me want to find some more non-cardigan sweaters for my fall/winter wardrobe. That skirt you're wearing is also super cool. I love the shape of it. At the risk of comment-spamming.. Your recent post: those webcam photos killed me. You make me smile with your mask and all! Post previous to this one: I feel nostalgic towards so many of my clothes.. I have memories in them, of them, who I was, if that makes sense. I've never seen that show but want to now from what you said! 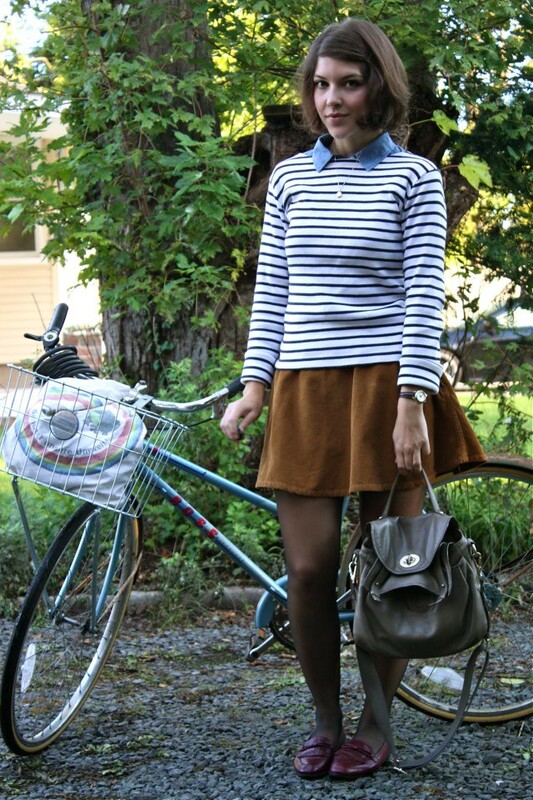 Love those loafers & great fall look w/ the sweater & top layer over a skirt, you look so cute!